The overall experience was great, we had a really good time! The location was a little further than I like but it wasn't too bad! I would have gave the cleaning a higher number but the main floor of the cabin the floors seemed dirty like the living room and kitchen area. We had several babies that were crawling and they would have black stuff on them from the floors. Other than that the bedrooms and bathrooms were clean! The only other complaint I would have is you could hear every little noise, we were on the bottom floor so we heard everything that was going on! I would definitely come back, we really enjoyed the hot tubs and pool table downstairs! Me and my family enjoyed our stay beds were very comfortable!!! But some of the games didnt work and we couldnt not grill the day we wanted but they came out a fixed it and we were able to grill next day other then that great cabin!! Everything was great - except for the check-in process. We opted for the express check-in process, which seemed to be the best choice. However, the code given for the gate was incorrect, and there was no cell phone service to call the office from the gate. We waited and tried the code multiple times. Thankfully, another guest let us through. Once we arrived to the beautiful cabin, we emailed the office using the cabin's wi-fi, and promptly received a new code. I gave everything a 10/10 besides the value (9/10) only because they hit you with a few $100 in cleaning fees at check out that you don't really expect, but in all honesty I will gladly pay it again. Our group had an absolute blast and was very impressed with the cabin. I was a little disappointed to see one of the pull out beds were broken and the propane tank for the grill was empty so we had to change dinner plans one night and a couple expected a bed ended up on a couch all week. I did call 2 days in advance to have them check on little things like this (specifically propane) and they said they don't check unless the previous guest has made a work order. So I took it upon myself to let them know about everything I personally saw and they said it would be taken care of. Other than those minor things the cabin was absolutely gorgeous and fit our needs perfectly! I would 10/10 recommend for anyone looking to stay in the area! This is second year we've stayed at Dreamland. This cabin is listed with CabinsUSA. My entire family has enjoyed this gift from my mother for Christmas. Everything with these visits were nice and enjoyable. There were a couple issues but were handled by the staff. We were looking forward to a third year but the prices have gone up over $100. For admistration fees cleaning fees so this is our last time. I know if you rent this cabin you'll enjoy it. We had 4 adults and 3 kids in our group and we had a fantastic stay at Dreamland! It was our first time in a cabin, and it was one to remember! Plenty of space, hot Jacuzzi, comfortable beds and everything we needed. We even cooked and had the proper utensils and dishes. There was dust in the bathrooms on the walls and ledges but i'm assuming maybe from the heat being on, not sure but could use a quick wipe down. However, the towels and tubs and everything were clean! The cabin is well maintained and kept. Our only worry was the air hockey table, it is quite old and standing up by a thread. The legs on it are very weak making the table super flimsy. Being there is a sign posted in the game-room, if anything is broken you are responsible for it, we unplugged it and didn't let the kids play with it, which they were bummed about. Other than that, we felt safe and secure and will visit again! Thank you CabinsUSA for the easy check in/out. Our bedding could have been cleaner. Other than that we were exceptionally happy. Thanks so very much. The service we had before we arrived was a 10+. Stacey went out of her way to make things very smooth and wonderfully easy for me, to reserve this cabin. You are lucky to have someone so great with the public. She is kind, very polite, helpful, and deserves to be recognized. It’s hard to find people who enjoy the public these days. She does! She is management quality. First I want to say this is probably one of my favorite places that our family has ever stayed. The view was beautiful the cabin was beautiful everything was just wonderful. The only negatives I have are fairly small. I feel like the cabin needs to be a little bit more child-friendly like extra locks going out on the deck because two and three-year-olds can unlock that regular lock also you need cups for children extra towels and extra Linens. The dryer was broken while we were staying there so it was really difficult to make do with the couple of towels they have in the cabin. The only reason I didn't give it a 10 and cleanliness is because the grill is really dirty and we had a small grease fire that we had to put out because it was so dirty and the hot tub smells like mold on the lower level so I think it needs a little more attention, and the hot tub on the higher level was not heating properly. Other than that we will rent this cabin again my whole family loved it we loved the area we loved the view it was high but not too high it was perfect and the cabin was wonderful the game room was used every night we were there. Ironically the reason why we chose this site was because of the indoor pool however it needs to be known that it is not a heated pool it was so cold even like my DieHard swimmer grandchildren who want to swim all the time couldn't get in the pool because the indoor pool was so cold. We stayed at Dreamland Cabin for 3 days. Enjoyed every minute of it. I would recommend it. Great place to stay. 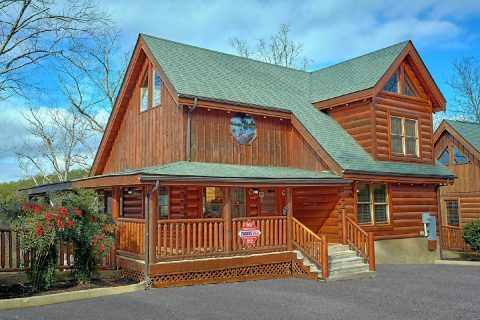 I loved this cabin, it was spacious, beautiful, inviting, and had everything I was looking for when I booked a cabin for my brother’s wedding for my family to stay in. There were some things that I wish had of been better: firstly the cabin needed dusting, the shower curtain liner in the showers had mildew, the washer/dryer didn’t work, the couches weren’t the most comfortable, and the upstairs hot tub would not go above 85 degrees and was very loud all day and night. With that being said these were minor inconveniences as overall we had a great experience and loved the cabin very much. I’d book again with Cabins USA. The cleanliness and amenities of the house are first rate. The driveway to the house was not easy (I was pulling a trailer). The sleeping accommodations, entertainment (TVs, CD, DirectTV, pool table, etc) were also first rate. Hot tub and hot water were all excellent. There were ten of us and and the house enabled all to have a great week--with one exception. The WiFi, is just over dialup speed from the 1990's (the only reason the property didn't get a ten). So eight young adults did find that a challenge. The WiFi is probably a byproduct of the location. We very much enjoyed the back porch and the grill worked great. The property was also convenient to Pigeon Forge and Gatlinburg. So if one wanted to get away from the connected world, read a book and/or play games with the family this was ideal. The cabin is very pretty and very roomy. Our family enjoyed the stay and we had lots of room to do things. Our only problem with the cabin was there were roaches in it that came out at night and the roads to get to the cabin are a bit curvy and small. The resort is nice but however the pool is very small for the size of the resort. The outdoor pool was not open when we were there but it should be open during the summer so that may help with the overcrowding in the indoor pool. All in all we had a great trip and cant wait to come back. Great place in a great location. Beautiful view and great amenities. Cabins are very close to one another. Beds are very old and make a lot of noise at night. This was a very nice cabin. We had a great time here. The beds were so comfortable. The only problem we had was the internet was not good at all and none of our phones had service. This was the first place out of all the other cabins that we could not use our phones. Other than that it was a very nice cabin. We look forward to coming back and staying with cabins USA like we always do. The first day our gate key didn’t work after traveling 12 hrs we had to sit and wait to get in touch with someone. All in all it was a stay we enjoyed its a beautiful place! Can’t wait to visit again. First I want to say that this is a very nice cabin. We liked the location. Easy to get to and close to Pigeon Forge. The layout is nice. Loved the large tv in the living room. Nice furnishings. I had to speak to the staff after leaving just to let them know that there are some small issues. Hopefully these issues will be corrected for future renters. I will give examples so renters can be warned in advance. There was one dishrag and one dish towel. No potholders! Coffee maker made lousy coffee. Two can openers and neither worked. Skillets are old and everything sticks. Garden tub on second floor, largest in the cabin, couldn't be used due to running out of hot water before filling up completely. Neither fire place worked. I'm sure they will have them fixed but before renting I would make sure they are. All and all, it's a nice cabin. As I said, small issues. All easily taken care of. This was a great cabin with a lot of amenities. It was neat and well kept. The bedrooms were spacious and had their own private bath. There was a half bath on the main floor which was nice as well. The kitchen was also spacious with a large table and plenty of seating. It has two hot tubs, but one was out of order when we were there. Our trip was a long weekend for four couples, and it was ideal for that. It is only about 3 miles from the Parkway, but it is a good 10-15 minute drive because of the winding back roads you must take to get there. Overall, my group was pleased with our stay, and I would rent this cabin again and recommend it to others. It is a very nice cabin it was prefect for my family. Great property. Need to fix downstairs hot tub. Jets would not come on the downstairs hot tub. The upstairs hot tub was not preheated to 103 so it took about six hours to heat the water. Couldnt find a password for the Wifi anywhere. Had previously booked another cabin with Cabins USA...upon arriving at the cabin it was still being cleaned and was not in good shape. Went back to the office and they booked us at this cabin with no problems at all. Will be booking from them in the future. Cabin was very clean and had a lot of amenities. The only thing I saw was that the upper part of the cabins walls need to be dusted which was not a big deal. everything was great -- wish we could have stayed longer!!!!! We'll be back!!!!! Need Shampoo and Coffee as a standard amenity. Loved the property and process. Will do this again. The staff did an exceptional job of providing us with a few items that were missing when we got there. Very impressive. A staff member helped figure out the coffee maker as well. Very nice and polite staff. This was an exceptional cabin and location. We were moved here for two days from our cabin, Simply the Smokies. because the HOA at that resort was shutting the water off for two days. Dreamland was beautiful and very well maintained. We did not want to switch back to our original location but did understand that people who had paid for Dreamland would need to get into it. I would definitely recommend this cabin. When we arrived it was very warm in the cabin 75° it did take about 5 hours to cool it off on the main level. The second hottub was unusable do to being dirty and debris all in it with an awful stink to it. This cabin could use a deep cleaning. Like floors in bathrooms, the Jets in tubs. The jacuzzi tub upstairs didn't work. Bricks from fireplace were falling off on the sides. Info about wifi and directions to the pools would have been nice to have in the cabin instead of having to call to find out password. The girl couldn't give us directions to pool bc she didn't know. But all in all our family had a great weekend. We were originally in Catch a Star and there was some issues with septic, so we had to be moved. The office worked with us and gave us something as close to what we had as they could. We really enjoyed the place, it was so nice and clean and the view was amazing. We had 3 couples and each of us had a level...was really nice. We also enjoyed having the pool table and pacman machine. It had 2 hot tubs, but we never did try them out, it was too cold. We will be back again next year. Enjoyed booking with a great company. The staff were very helping with the booking process and checking in. The cabin was outstanding. Plenty of room and comfort. Looking forward to booking with Cabins USA in the future.